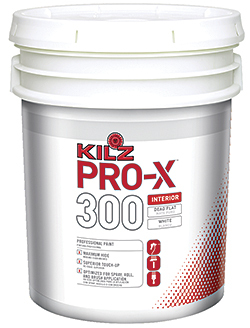 The KILZ Pro-X line is formulated to optimize spray, roll, and brush application. The 300 Series provides improved touch-up and superior hiding, and it emits low levels of odor and volatile organic compounds (VOC). The 310 (flat), 330 (eggshell), and 370 (semi-gloss) are available in a two-base system workers can tint to more than 1,000 colors. The 100 Series interior latex paint is designed for ceilings and walls, and workers can tint it to five white colors.